Bring your own gloves and yard-working shoes. Two cities, two counties, two states and ONE LAKE! 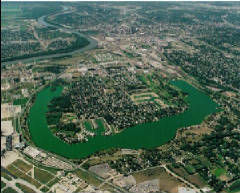 Carter Lake is an old oxbow lake of the Missouri River and is now an urban lake shared by two different cities (Omaha, Nebraska and Carter Lake, Iowa), in two counties (Douglas and Pottawattamie) and two states (Nebraska and Iowa). 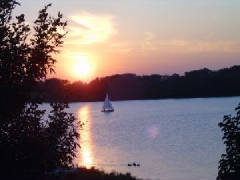 The City of Carter Lake, Iowa lies completely within the concave portion of the lake and the City of Omaha and Levi Carter Park surrounds the lake on its convex side. The Carter Lake Preservation Society, Inc. is an Iowa non-profit corporation formed as a result of community action and commitment to improving the Carter Lake watershed. The lake has never had a single, shared voice of advocacy. Carter Lake Preservation Society (CLPS) was formed to be a single shared voice of advocacy for the lake and to speak with energy and commitment necessary to find solutions to the impairments that affect the Carter Lake watershed. The Carter Lake Preservation Society has been designated as a public charity and a 501 (c) (3) exempt organization by the IRS.